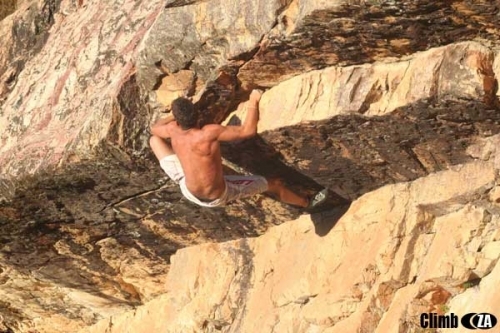 Are there Sport climbing / Boulder climbing at Beaverlac? Where can I find information of the crags / routes? I'm planning to go there for Easter Holiday. upstream from the main pool Hilton Alan and I did a few routes on the main face at about 18,I am sure climber have been there many times before.lots of boulders around the camp site on the south side. Aside from climbing at the main pool (See below) there is bouldering around (just not sure where exactly). Be cool to post a topo in the Wiki if you're up to it!? Nick Aitchison, bouldering above the water at Beaverlac, Porterville mountains, Western Cape. That picture you posted of the high problem is a project I have worked the past two times I've been at Beaverlac. On my first trip to that pool I was amazed at the quality of some of the stuff on that boulder, and even though the rock has been smoothed by the water over the years, it has a considerable amount of friction with a bit of chalk. I've opened a few lines there, a 7B on the same boulder but right in the inside, which uses finger pockets to move out and right and out the cave, a 6C on the boulder next to it, a fun 6A which entails crawling through a hole, and a few easier ones to be opened soon hopefully. That line in the pic is actually really hard, once you start moving up the arete the holds disappear, and there is one potential move to a crimp up and right, which I have yet to try and will probably work on top rope. The line will likely be harder than 8A and would be a classic line if it ends up being possible. After a few more trips in the coming months I'd like to develop more stuff and get a topo going eventually. Anybody got more info on "Apparently there are four bolted routes at a crag up from the river (see excuses above to why we didn’t pay it a visit!)" Beaverlav has so much potential for bouldering. Here is a pic from my last trip of the area. Didn't have a long enough weekend to explore too much but will definently be going back. This was taken just 10 minutes up the path from the main pool. Rastaman wrote: Anybody got more info on "Apparently there are four bolted routes at a crag up from the river (see excuses above to why we didn’t pay it a visit!)" Heading to Beaverlac this coming weekend - is there any updated info / topos? Can the anchor be accessed from the top (going with a crowd of non-climbers so would have to rope solo)? I like climbing too.It is so cool! Last edited by Thoms124 on Fri Sep 22, 2017 5:30 am, edited 2 times in total.